There are a number of stages throughout the drilling and completions phase where Roemex speciality chemicals are used to improve drilling efficiency and performance. Roemex wellbore cleaners are designed to clean all drilling fluid systems at high and low temperatures. At the end of the drilling process, Roemex cleaners remove drilling fluid and other residues that would remain in the wellbore. Efficient well clean-ups reduce cost, improve productivity and greatly contributes to the success of future well operations. Pipe dope dissolver products are designed to remove pipe dope from the drill pipe. 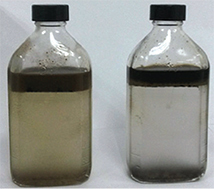 These grease type compounds can cause significant impairment of productivity and are used either as part of wellbore clean-out train or as a pipe pickle treatment. 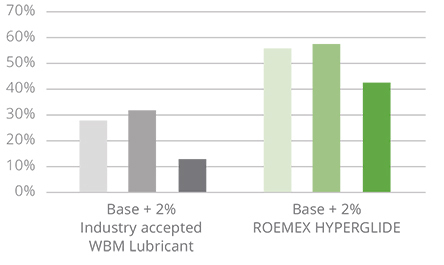 Treatment with Roemex lubricants, significantly reduces the down-hole torque and drag forces exerted on subsurface strings. Our lubricants and friction reducers are applied to treat water, brine and water based drilling fluids (WBM). Whilst drilling the reservoir section, filter cake is created. Filter cake can restrict the flow of fluids through sand control screens and other types of completion hardware. Roemex filter cake remediation treatments uniformly attack, breakdown, and remove filter cake, to maximise production potential, they can also be applied to treat other types of formation damage as well. Roemex supply a range of SPRA to free deferentially stuck pipe in both OBM and WBM. The addition of Roemex chemicals in the separator tank will enable simple and efficient separation of oil, water and sand. Roemex chemicals can be used for washing and cleaning dirt and debris from topside deck areas. Roemex carries out specialist R&D to provide individual drilling and completion chemical solutions to meet and exceed specific customer needs. Wellbore Cleaning chemicals are used to aid in the removal of solids and synthetic or oil-based mud residues to prepare the wellbore for the completion following the drilling phase. A displacement involves pumping specifically designed clean-up pills around the wellbore, pushing out the mud and cleaning the casing, leaving metal surfaces free of residues. Completion operations often involve the use of sensitive equipment. Failures when running the completion can be very costly both in rig time and equipment cost. Ensuring the well is debris and oil free will reduce the likelihood of production impairment in the wellbore and near wellbore formation. RX-03X Well Cleaner is designed and used globally, to thoroughly remove synthetic or oil-based residues from the wellbore, leaving tubulars in a clean and water wet state. It is compatible with all commonly used brines and highly effective in low or high temperature wells. Two modes of action; cleans and focculates. Flocculation is a process wherein colloids aggregate in a fluid to form flocs that are separated more easily from the fluid. As shown, the industry benchmark (LHS), when tested under the same conditions as RX-03X Well Cleaner (RHS), has a cloudier water phase, this is because it still contains a higher level of dispersed particles. This means that more time will be required with the benchmark product, compared to RX-03X Well Cleaner, before acceptable levels of separation are reached. Lubricants are required in many applications in the oil and gas industry. In the drilling phase, lubricants, such as HyperGlide, are required to reduce the coefficient of friction, to enable highly deviated and challenging well geometries to be drilled successfully, by helping to limit the torque and drag forces, exerted on the drill string, to acceptable levels. Lubricants, are also used in completion and workover operations too, where “solids free” salt solutions or brines require treatment with a friction reducer. Roemex produces industry leading friction reducers, expressly optimised for use in clear brines, like RX-72TL. Enhanced lubricity properties; it is a brine miscible product, it will not cheese or grease out on to equipment like other types of brine immiscible, self-emulsifying, products. Environmentally responsible; Gold with no substitution warning rating in UK and Netherlands, and Yellow rating for Norway. 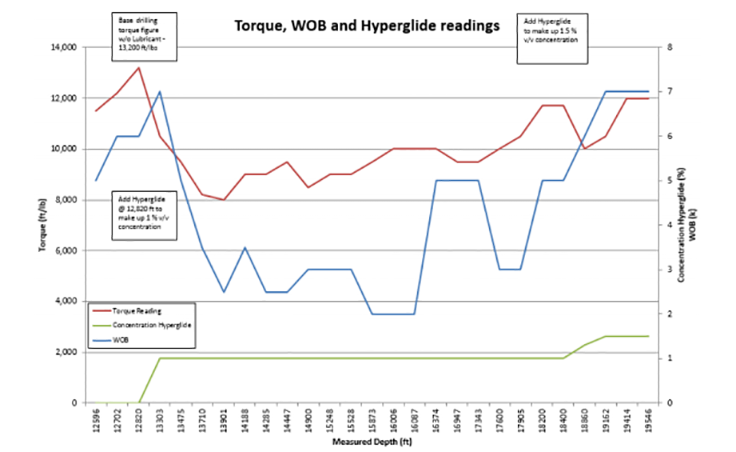 Enhanced levels of torque reduction for an extended period, compared to other available products. Compatible with many water based drilling fluid systems over a wide range of conditions. 3rd bar = % torque reduction after aging for 40hr at 75°C. 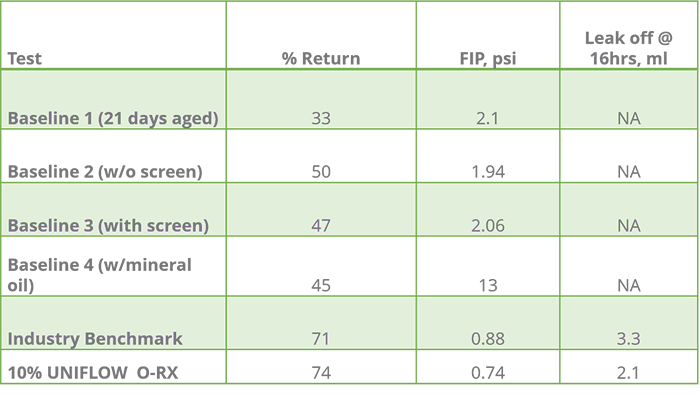 HyperGlide provides high levels of torque reduction, for a longer period of time when compared directly to an industry benchmark. This promises to deliver lower dosage rates that last longer. Field data demonstrating the efficacy of HYPERGLIDE 6 1/8" section at a concentration of 1 to 1.5% by vol. When drilling a permeable reservoir section, the drilling fluid (mud) forms a filter cake on the walls of the wellbore. These cakes and fluid residues, can become trapped behind the completion hardware, like a slotted liner or wire wrapped screen and block the apertures to the flow of fluids, which can adversely affect production rates. The Roemex UniFlow system is designed to remedy this and other sources of formation damage. Due to the differing nature of filter cakes, produced by alternate types of mud, under variable well conditions, the UniFlow system comprises of several products, so that treatments can be optimised to meet specific demands. The UniFlow products are created from the latest, low hazard, environmentally acceptable technologies to deliver improved breakdown of mud deposits in a controlled and uniform mode of action. Uniflow O-RX the remediation for oil-based filter cake and residues. Uniflow W-RX the remediation for water based filter cake and residues. UniBreak breakers are supplementary additives, such as enzymes, added at a low concentration to the main UniFlow W-RX treatment fluid to degrade polymers in water based filter cakes. UniFlow O-RX and W-RX are concentrated standalone products, simplifying handling and logistics. UniFlow O-RX and W-RX have two modes of action, to dissolve and disperse mud residues and remove potential sources of damage. UniFlow O-RX and W-RX demonstrate enhanced stability in typical brines at elevated temperatures, and resist phase separation, so optimal performance is maintained. Both UniFlow O-RX and W-RX have acceptable environmental ratings. 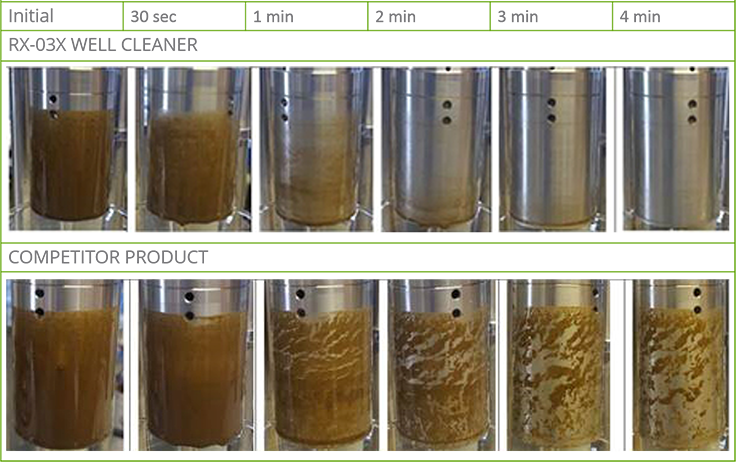 The results demonstrate the benefit of using a remediation treatment compared to the baselines in general and UNIFLOW O-RX in particular in terms of % regained permeability and lower flow initiation pressure. During drilling operations the drill string may become stuck and cannot be raised, lowered, or rotated due to differential pressure forcing the drill pipe into the filter cake that builds up on the edges of a permeable wellbore. This is a common issue which can be expensive to resolve. Consequently, Roemex supply a range of SPRA to free deferentially stuck pipe in both OBM and WBM. 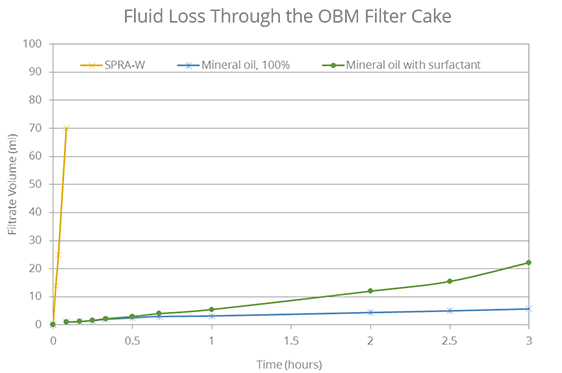 Chart showing how fluid loss through an oil based mud (OBM) filter cake is dramatically increased when exposed to a Roemex SPRA-W signifying high levels of cake disruption, which can help greatly in freeing an embedded drill pipe. OBM filter cake, after exposure to Roemex SPRA, mineral oil, and mineral oil + surfactant. Roemex's expertise in optimising chemistry to resolve fluids of differing composition in variable processes, enables the simple and efficient separation of oil, water and solids. Roemex supplies a complete range of environmentally acceptable hard surface cleaners for removing dirt and contamination from tanks, equipment and deck areas. With its modern R&D facility, extensive range of laboratory equipment and highly experienced team of chemists, Roemex carries out tailored R&D to provide individual chemical solutions to satisfy and exceed the non-routine needs of each customer.